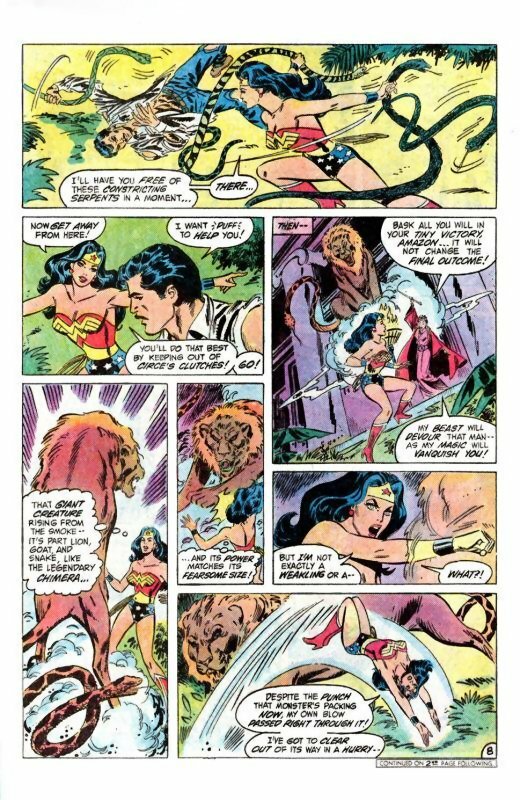 Wonder Woman realises that her only hope is to take advantage of the fact that Griggs’ transformation into the Ram Beast has left him as slow-witted as he is strong. At the very last instant she side steps out of the way of the charging creature, sending him ploughing into the other watching beasts behind her. As a result, an angry Gorilla confronts the Ram and Circe bellows at her pets to stop fighting amongst themselves and destroy the Amazon. The Ram turns to charge again and Wonder Woman tries to reason with the Man inside the creature. She asks him to remember who he really is and tells him he is no one’s slave. The creature looks at her bemused for an instant but Circe orders him to ignore Wonder Woman’s words and reminds him he is her faithful pet and will do her bidding. 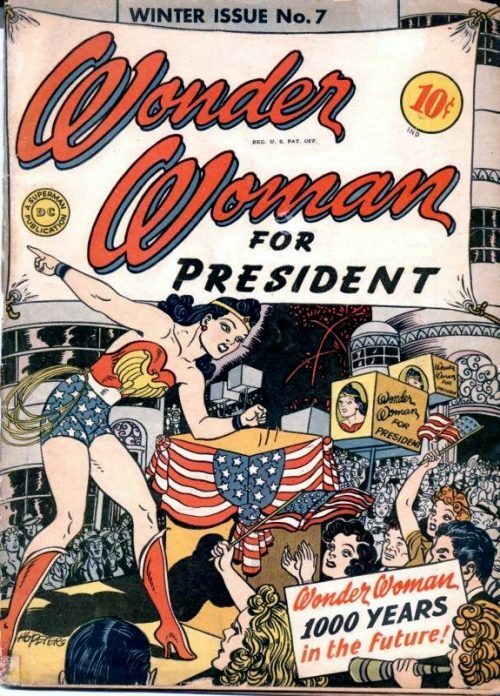 But Wonder Woman continues to appeal to him, asking him to resist Circe’s will. Circe in turn bellows at him to obey her and kill Wonder Woman. At last the Ram makes his charge at the Amazon Princess and she raises her bracelets to protect herself. She hopes that the glimmer of intellect she had spotted just before he charged was for real and prays he is attempting to do what she thinks he is. This time she makes no move to get out of the way and the creature’s horns collides with her bracelets, separating them apart! Instantly, she can feel her Amazon powers returning and is glad to see that Griggs has also freed himself from Circe’s spell as he begins to transform back into a man. 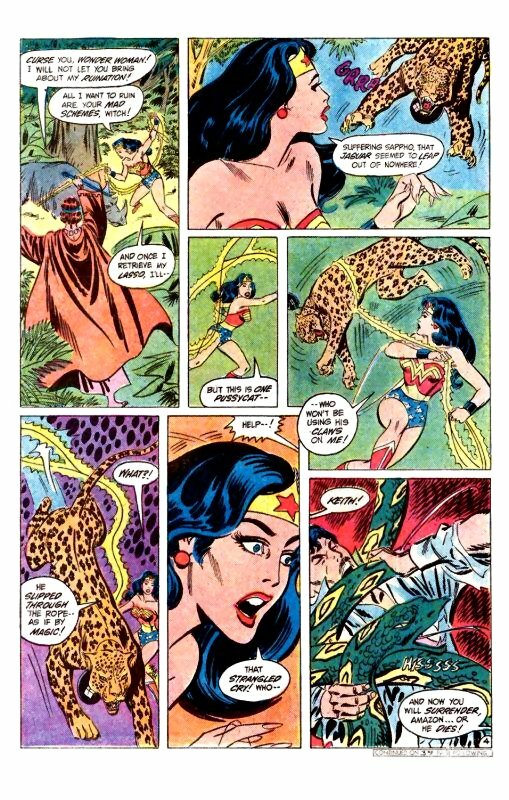 A furious Circe curses Wonder Woman as the Amazon retrieves her lasso from the bound Rhino. Suddenly a Jaguar leaps down towards her as if from nowhere. She moves like lightning and quickly ensnares the cat in her lasso. But her victory is short lived as the Jaguar slips through her golden rope as if by magic! Then she hears a strangled cry from Griggs who has now returned to normal but is being choked by a large snake. 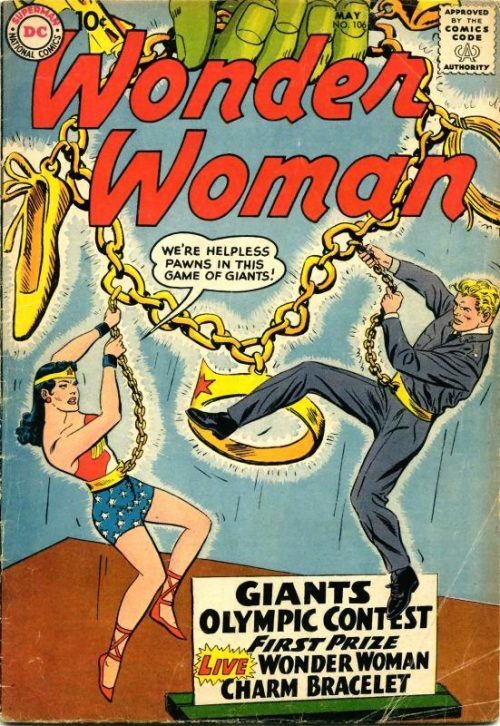 Circe tells Wonder Woman she must surrender now or else Griggs will die! 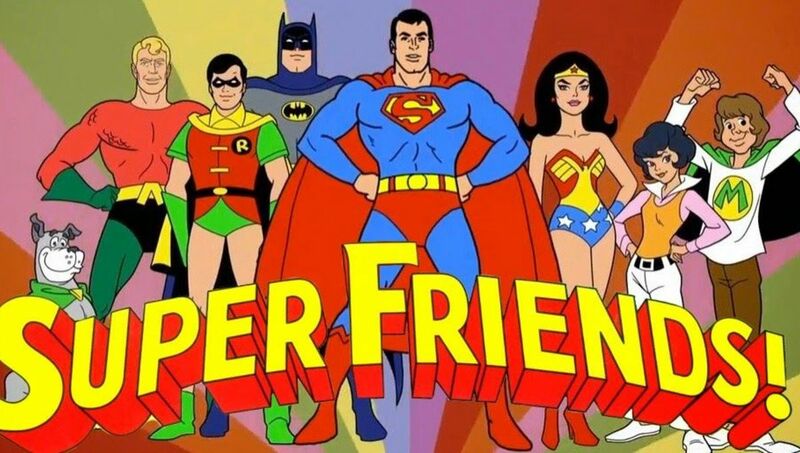 But currently Wonder Woman has other things to worry about as her arms are held behind her back by two Man Beasts standing outside the Temple. She asks Circe why the witch has repeatedly tried to attack her? What has she ever done to make her hate her so? Circe replies that it is not what she has done, but what she might do that makes them bitter foes. She goes on to explain that it was foretold by an oracle that Hippolyta’s daughter could be Circe’s undoing. So she had therefore made plans to forestall that event by eliminating the Amazon Princess first! 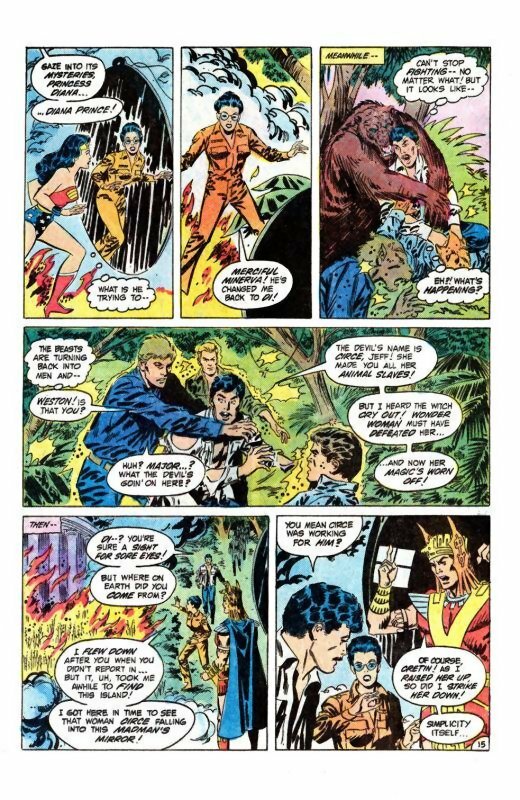 Wonder Woman responds that if she is the one Circe wants then why not let Major Griggs go? Circe smiles and replies that perhaps she is right as he has already served his purpose. She then orders the snake to kill him! 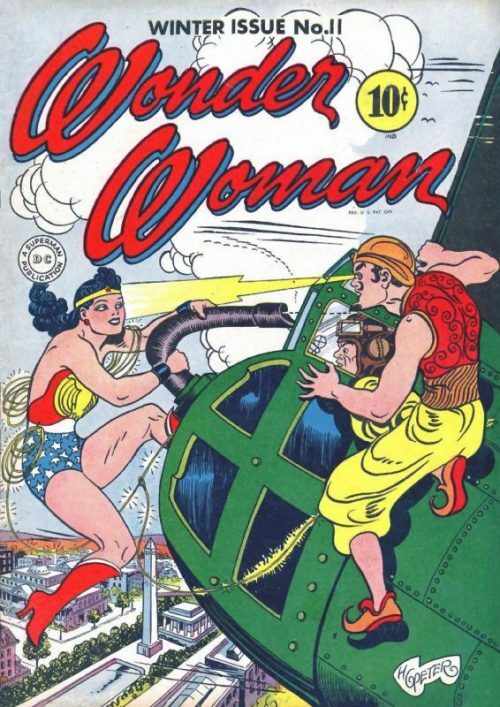 Wonder Woman cries out “No!” and hurls her two captors over her head sending them sailing through the air. One of them collides with a burning torch on the steps of the Temple. Circe rushes to stop the torch toppling over, crying out that flames were part of the Prophecy. 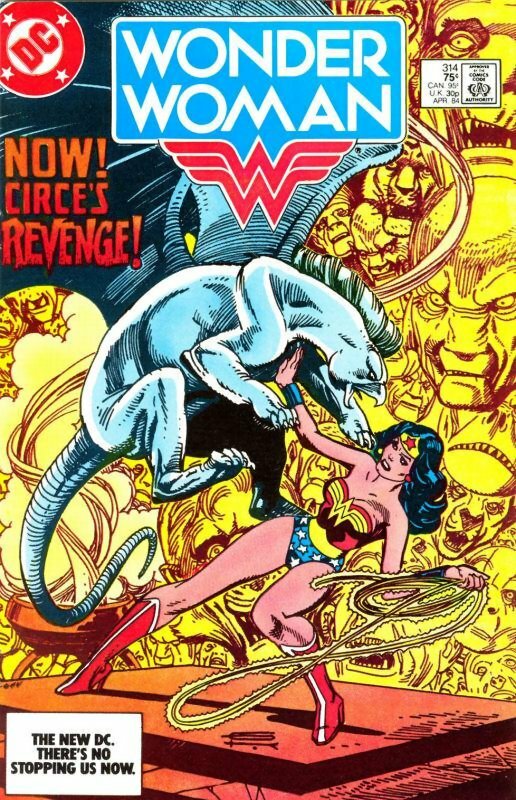 At the same time Wonder Woman races over to where Griggs struggles against the snake’s tightening coils. She yanks the creature from him and then orders Griggs to get way from the area. He says he wants to help her but she tells him that he will help her best by keeping out of the witch’s clutches. Circe then tells Wonder Woman to bask in her tiny victory while she can because it will not change the final outcome. With that she conjures another huge hybrid creature out of thin air and says that the beast will devour Griggs just as her magic will vanquish the Amazon! Wonder Woman sees that her new foe is part Lion, part Goat and part Snake. As she takes a powerful blow from its paws she also realises it has immense power as well as size. She throws her own punch in return but her fist sails right through the beast as if it were a cloud of mist. She realises a different tactic is required and leaps out of its way. She then removes her lasso and twirling it over her head, decides that if the creature is too insubstantial to be touched, then perhaps the wind her lasso is whipping up will dissipate its smoky form. Sure enough her plan works and Circe despairs. What does it take to stop the Amazon? She calls upon her lover to aid her once more. 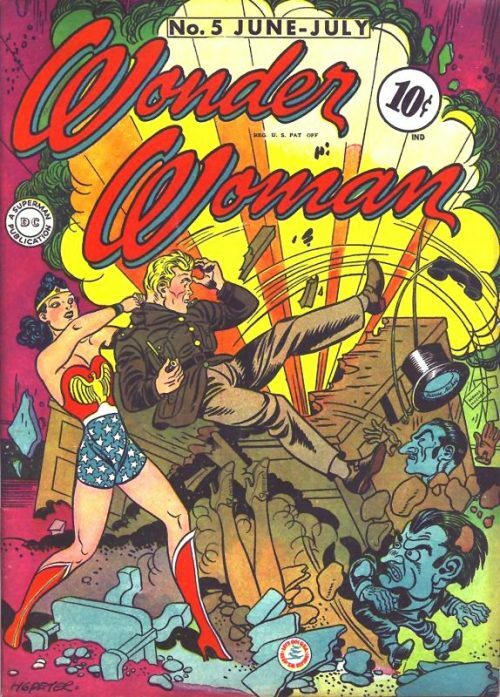 Another storm brews rapidly in the sky above and the witch orders Wonder Woman to be annihilated. For her part, the Amazing Amazon muses on Circe’s remark about “her lover” which confirms her suspicions that the witch has a male accomplice. That is how the lightning was able to fuse her bracelets and strip her of her Amazon strength before. As a bolt of lightning zaps down toward her again she wonders whether perhaps this hidden ally of Circe’s is the one who is the true master? She defends herself with her bracelets again, ensuring that this time she only uses one at a time to prevent them being fused together again. As the lightning rebounds of her bracelet, it strikes the nearby undergrowth which catches alight. Circe screams in fear as she sees the flames advance rapidly, realising that she has been doomed by Wonder Woman just as foretold. Many miles away at Andrews Air Force base, Steve Trevor is calling out to Wonder Woman’s Robot plane which has now been instructed to respond to his voice. He starts to wonder why his commands do not seem to be working when almost out of nowhere the plan touches down in front of him. Inside the cockpit he sees the reason for the plane’s delayed response. The little Gremlin is seated inside, smiling at him impishly. Steve realises he should have guessed the Gremlin would be the cause and asks the creature how the plane is flying? The Gremlin replies that there are still a few bugs but nothing that he cannot fix. The plane itself the adds that the Gremlin had told it exactly the same thing right before he drove a screwdriver through its Gyro-Guidence! Steve tells the two of them to stop bickering and suddenly hears his name being called. He turns to see Lisa Abernathy being escorted towards him by an Air Force Sergeant. She apologises for interrupting whatever he is doing out here on the tarmac but Etta had told her where to find him. She continues that she has come about the Senate Investigation which she has been covering for her TV Network. Steve replies that the Pentagon has a Press Office to handle such things, while at the same time thinking to himself that it is strange how Lisa does not appear to see the Gremlin! Lisa then says that it is not just as a reporter that she needs to speak with him, as her sources tell her that the Chairman, Senator Covington, is on the warpath. Steve tells her that General Darnell is well aware that Covington is no friend of the Pentagon. She replies that what the General does not realise is the lengths to which the committee will go to find a scapegoat. The Senator thinks he has got one on Darnell and he is not above pushing the General into making a highly visible blunder. Back on Circe’s Island, Wonder Woman asks the witch not to be a fool and to stay away from the spreading flames. But Circe is distraught that her precious herbs are being destroyed. The herbs will only grow on this fertile soil and they are needed for her Elixir of Life. Without it she will age and die like an ordinary woman. She turns to the watching Jaguar, asking her lover to help her save the herbs. But the air is filled with mocking laughter and with a snarl, the Jaguar summons an Obsidian Mirror out of nowhere. The black mirror grows larger and its inky surface reflects an image that Circe refuses to look at. She cries that there is still time to save the herbs and continue to make the Elixir of Life. But although she begs not to see what the mirror shows her, she finally has no choice and turns to see herself as an old crone. She refuses to accept the image though and raises her staff to shatter the mirror. But her form vanishes inside the black mirror, swallowing her completely. Not far away, Griggs is still grappling with the Bear and other beasts which have him surrounded. Just as his hope begins to fail the creatures suddenly transform back into human form. Griggs tells the dazed men that they have been the victim of a witch called Circe. But he had heard her cry out which must mean that Wonder Woman has defeated her, hence the reason why her magic has worn off. They then make their way back towards the burning Temple where they see Diana Prince standing there, next to the giant Aztec God. Griggs tells Diana he is glad to see her but wonders where on earth she has come from all of a sudden? She thinks on her feet and replies that she had flown down here after Griggs went missing, but that it had taken her a while to find the right island. She had got here just in time to see Circe fall into this mad man’s mirror. She points up to the towering Aztec and Griggs guesses that Circe must have been working for him. The Aztec God bellows that of as he had raised Circe up, so he had struck her down! He is the creator and the destroyer of all things. Discord and confusion are his delights and he finds their fear entertaining. The mirror suddenly emits swirling smoke which surrounds them both. Diana feels strange, almost like she is floating as if in a dream. And as the smoke begins to clear again she and Griggs find themselves standing in an Aztec city, with fearsome armed Aztec warriors standing before them. 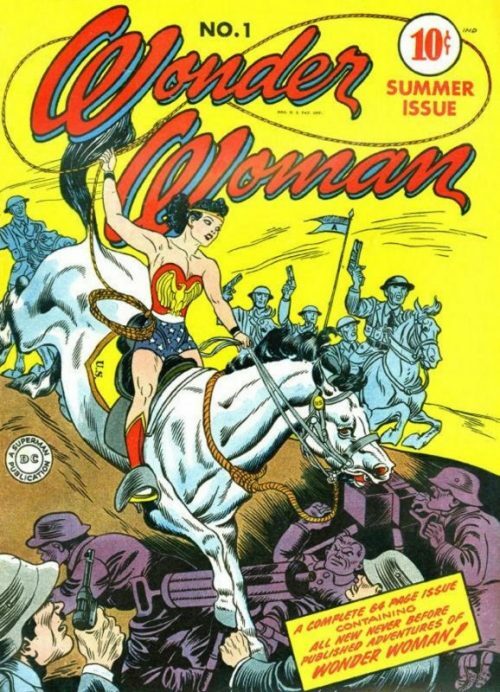 Suddenly they hear a woman’s voice behind them and Diana turns to see armed female warriors dressed in familiar armour. As she and Griggs are forced to accompany the female soldiers, Diana wonders where on earth they have been transported to and how there could possibly be Amazons here?